Oh My Goodness what an action packed class we had! 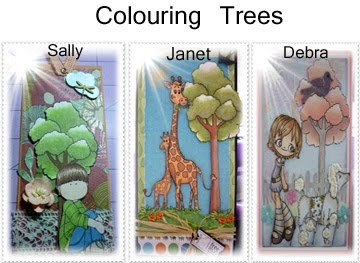 we learnt how to create a grassy effect as well as adding shrubs and colouring a tree image, as you can see by the swaps only three of us created tags to share! We had a small extended break from class because our dear teach Debra wasn't feeling too well. Here are our tag swaps! Please let me know what you think - so i can pass it along to the girls! How gorgeous! Very clever you all are!! So sweet, thanks for sharing! Copic class - grounding your image!